The San Diego 50 & Trail Marathon is made possible with cooperation and support from the San Dieguito River Park and Black Mountain Open Space Park. Aid Stations are located approximately every 4-6 miles. They are fully stocked with water, electrolyte drink, energy gels, fruit, and snacks. All participants will receive a long sleeve technical running shirt and finishers will receive unique medals. Drop Bags are allowed and will be available at the following Aid Stations: Mile 20 & Mile 30. Drop bags are to be provided by the runner and clearly labeled with the runner’s LAST NAME and BIB # and must be at the race start no later than 6AM. Drop bags will not be returned to the Start area until after the Mile 30 Aid Station (Bing Crosby 2) closes. This means bags will not be returned to the start area until 5PM at the absolute earliest! Bags must be claimed at the Finish; any bag not claimed by the completion of the event will be discarded and all useable items will be donated. Bags will NOT be held beyond race day. There is a 13 hour time limit for the 50 mile event with intermediary cutoffs at aid stations. All runners are required to carry a minimum amount of hydration with them throughout the event. Marathon participants must have no less than a hydration belt (10 oz). 50 Mile participants must carry at least a 20 oz Hand Bottle throughout the event. These can be substituted with various belts, packs, bottles that best fit your running needs, but all participants must carry their own fluid container. This not only helps ensure your safety and performance on the course, but also helps us cut down on waste and keep the event as green as possible. Aid stations will be well stocked with water, electrolyte drink, gels, snacks and salt tabs. However, it is STRONGLY encouraged that you carry your own salt and gels; use the aid stations to supplement as needed. Again, this is to best ensure your safety and performance on the course and cut down on waste. 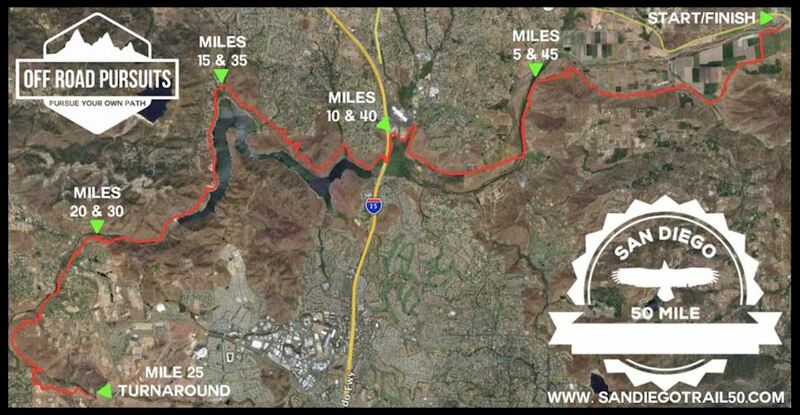 The San Diego 50 and Trail Marathon course will feature some of the beautiful trails of the San Dieguito River Park and the Black Mountain Open Space Park. The course will be a mix of double track, single track, fire road and a very small amount of paved running. Starting at the San Pasqual Valley Trailhead, 50 Mile and Marathon runners head WEST on the San Pasqual Valley Trail. This takes runners up and over Raptor Ridge and on to the Mule Hill Trail. Once reaching the Mule Hill Trail Head, runners will be diverted along the edge of the parking lot to the trailhead of the North Shore Lake Hodges Trail. This trail passes under Hwy 15 on a paved walkway, however there is dirt along the walkway if you would prefer to not run on the paved path. Once off the paved path, the trail becomes very scenic as you run a combination of double track, fire road, and single track all overlooking Lake Hodges. Marathon runners turn around just short of the marina and return along the same route they took outbound. 50 Mile runners continue on past the marina toward Del Dios Community Park. From here, the trail continues along the lake towards the Lake Hodges Dam where it connects to the Del Dios Gorge Trail. Once reaching the end of the Del Dios Gorge Trail, you continue on to the Santa Fe Valley Trail. From this trail, you enter a series of switchbacks that take you in to Black Mountain Open Space Park along the Lusardi Creek Loop Trail and your turnaround. Upon reaching the turnaround, 50 mile runners return along the exact same route you took outbound.